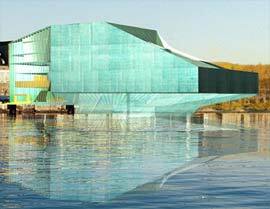 In early summer 2001 the Danish Ministry of Culture invited submissions to an international competition for architects to design a new playhouse for the Royal Theatre in Copenhagen – in an area of the harbour called Kvæsthusbroen, where the ferries to and from Oslo and Bornholm currently dock. It is quite unique to Copenhagen, and a powerful and charming sight, that two huge ships sail straight into the heart of an age-old city. Now the ferries will lie at anchor elsewhere, and in their place a theatre will be built. How can we prevent killing off the harbour when the dynamic forces that work there and keep it alive are constantly being eliminated? When all the cranes and lorries and ferries have vanished, and all we have left is the new library and block upon block of glass edifices, then the harbour will be dead. There will be no vibrancy, and no interaction with the water, which will lose its significance and be transformed into pure decoration. No new theatre has been built in Copenhagen since Det Ny Teater was erected in 1908. Since then there has been colossal development in theatre procedures. Not least during the 1930s when modern theatre was defined, and again in the 1980s when computerisation of technical systems to run a production was introduced in most theatres. But the question of technical up-dating is the easiest of all. The difficult question is: what kind of theatre does Danish theatre in general and the Royal Theatre in particular need? We met in secret one evening, at Dr.Dante’s new offices in the centre of Copenhagen, a large and diversified group: production designers, directors, technicians, stage crew, engineers and architects. I had sent them all an invitation, which included this question: We have such a proud architectural tradition in Denmark, and so many talented architects, so why have we got so many boring buildings? In the course of a series of meetings we, theatre professionals, put together all our experience of working in theatre buildings. We then listed everything we could hope for from a modern theatre. The architects listened and listened and asked question after question. But it was not until all the material had been gone through in meticulous detail that the first line was committed to paper. PLOT designed a floating theatre that, besides a number of financial advantages, had two crucial benefits: 1) the theatre would not be party to killing off the vibrancy of the harbour, but on the contrary would play a part in keeping it alive; 2) at one stroke the Royal Theatre would become a theatre for the whole nation, as it could be moved around the country; for example, to Århus for the annual arts festival. In terms of the actual auditoria, we are 100% convinced that the Royal Theatre has more need for a building that offers a challenge to the artists who work in it, than for a large palace providing a grand backdrop for their lofty work. Inside the theatre itself, all our aspirations resulted in the design of one large stage, which is both a traditional proscenium stage and at the same time flexible so that the opening could be up to 20 metres high and 40 metres wide, and thus the largest stage in Europe. A maximum stage depth of 90 metres means that in practise a motorcycle or a horse could be ridden directly towards the audience at a reasonably high speed. The smaller stage is equipped with an outer wall that can be opened, so that the harbour and water can be used as part of the set. The harbour and water can even be drawn into the stage picture itself if so desired – a sea battle, for example. If this outer door and the back wall of the large stage are opened at the same time, the audience in the large auditorium can witness a stage depth of 3-4 km, depending on visibility. A bonfire on the Swedish coast can be part of the production; actors can arrive by boat; the audience can see mermaids and sunsets and shipwrecks. Details of all these possibilities, and much more, are to be found on this website.